SpaceX has confirmed the date for its next Falcon 1 launch as April 21. The rocket will take off from Omelek Island in the Marshall Islands with Malaysia’s RazakSAT communications satellite and two secondary payloads. 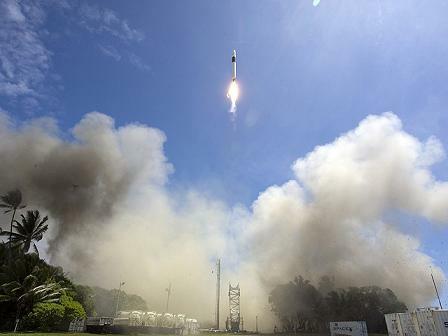 It will be the El Segundo, Calif.-based company’s fifth launch of the rocket, which has succeeded one and failed three times. I’ve followed SpaceX for a couple of years. I’m continually impressed that they do a very good job of meeting their requirements and schedules. This April 21st launch is really important for them. If this one succeeds, they will have established low-cost launching as a reliable option for clients. Until they have a few successful launches every one is a test in front of the world. I hope and pray that they are successful with the launch and with the introduction of smaller players into the space launch industry.